A fun tale with a hint of Russian history mixed in. 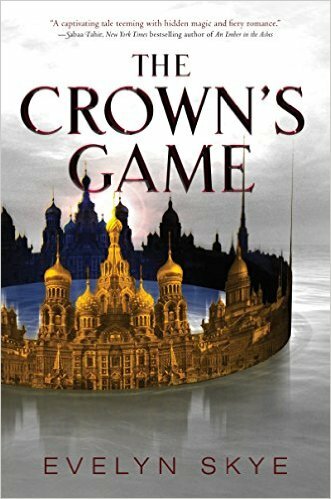 That’s how I summarize The Crown’s Game by debut author Evelyn Skye. SUMMARY (from back): Vika Andreyeva can summon the snow and turn ash into gold. Nikolai Karimov can see through walls and conjure bridges out of thin air. They are enchanters—the only two in Russia—and with the Ottoman Empire and the Kazakhs threatening, the tsar needs a powerful enchanter by his side. And so he initiates the Crown’s Game, an ancient duel of magical skill—the greatest test an enchanter will ever know. The victor becomes the Imperial Enchanter and the tsar’s most respected adviser. The defeated is sentenced to death. WHAT I THOUGHT: The concept of a wizarding duel is what hooked me on the book. Well, that and the amazing cover. That said though, I felt like the book didn’t quite live up to the expectations set. The book started out slow. The first half was filled with introducing characters etc, and I nearly put it down. But with the promise built up for the book, and the fact that it’s traditionally published, I hung in there. I enjoyed the three main characters: Vika, Nikolai and Pasha. Vika and Nikolai are enchanters while Pasha is heir to the throne of Russia. The three end up in a love triangle, which I didn’t mind, but my problem is I don’t feel like I got t o know the characters well enough to cheer for any of them. Things happen, but I’m left feeling incomplete. I wanted more depth. As for the plot, this, too, disappointed. I was never clear why either character chose to do what he/she did each turn. Short of one-ups-man-ship, I found what they did creative, but lacking context other than, do the next move bigger. Then there was the ending. I was hoping neither protagonist had to really die, that their magic would save the day somehow. I was disappointed. This is the debut of YA author Evelyn Skye so I will give her that, yet with it being traditionally published, I’d hope for more. I give this book 3 stars. Previous Previous post: Cover Reveal of Ann Snizek’s Latest YA Sci Fi!